Apple has filed a patent application for an online-store product-review system that turns the ideal of unbiased product evaluation on its head. 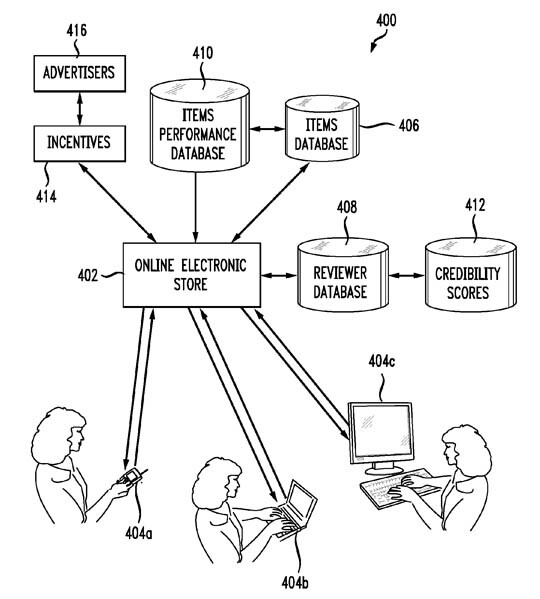 "The present invention relates to electronic commerce," the application reads, "and more specifically to using the collective wisdom of a community to predict rankings for items for sale in an electronic store." Many "collective wisdom" product-evaluation systems currently exist, of course, from Amazon to Epinions to Yelp and more. Many more. What makes Apple's filing unusual is that the system it describes "provides an incentive for individuals in the group of individuals whose associated predictive ranking coincides with the actual ranking of the item." In other words, reviewers in Apple's proposed system don't actually review products – apps, songs, whatever – they predict how well those products will sell, and slant their reviews and rankings accordingly. The more accurate their predictions, the more the reviewers are rewarded with "incentives". Those incentives can be as simple as "tangible or intangible incentives ... such as credibility points, exclusive media (such as songs, photos, user icons, etc. ), and others." Or the incentives can be cash, and that cash can come from "the media producer (i.e. a singer, artist, software publisher, and so forth) ... to generate promotional interest in their item in the online store." This is troubling. Essentially, media producers would be paying for predictions of their offerings' success. In addition, reviewers – predictors, actually – would be incentivized not to reward quality, but to lead purchasers to the products for which the reviewers might receive the highest rewards. Now, it might be possible to shield reviewers predictors – and, perhaps more important, their handlers – from the knowledge of which media producers provide the highest rewards, but anyone who has ever produced product reviews for, say, a computer magazine knows that an advertising sales force frequently takes it on the chin from aggrieved advertisers when a product receives an unfavorable review. Despite what suspicious readers often claim, most of today's product reviewers are scrupulous about not letting advertising dollars affect their evaluations. However, today's professional reviewers are being paid a flat rate whether their reviews make advertisers happy or not – although, admittedly, a publisher might tell a reviewer to hit the road if that worthy pisses of a deep-pockets advertiser one time too many. In Apple's scheme, reviewers are "incentivized" not to evaluate products in an unbiased way, but instead are paid to predict a product's market performance – paid with money provided by the producer of that product. And the wall between advertising revenue and unbiased reviews crumbles a bit. To be fair, an argument could be made that because reviewers would also be paid if their unfavorable predictions were accurate, Apple proposed system is not that different from the current one in which advertisers pay the freight, good review or bad. But since positive product reviews engender positive product sales, a reviewer's prediction wouldn't take place in a vacuum: more positive reviews would produce more sales, making that review's positive prediction more accurate, and making that advertiser happier and triggering more incentives. The filing also provides another protection intended to guard against bias: easy predictions would be rewarded less than risky ones: "For example," it reads, "if an extremely popular musician who has had multiple top 10 albums releases a new album, then a successful prediction of an expected result can be worth less. As another example, if a completely unknown musician with no previously released albums releases a new album, then a successful prediction of an expected result can be worth more." But to make that system work to a reviewer's financial advantage, that "less" would need to be a lot less, and that "more" would need to be a lot more. It's asking a lot of a reviewer to not be incentivized to benefit from many easy, less well-paid predictions rather than for them to hope for the occasional lucky, better-paid guess.